Every summer, my grandmother used to bake the most delicicious strawberry cake that everyone loved! The dough was so heavenly soft that it is until today my favourite recipe. On this beautiful summery day, I decided to carry on my grandmother`s tradition. I turned her original recipe into a new version of a luscious Strawberry-Lemon Cake. Super easy to make with a heavenly delicious cream – Grandma would lick her lips! 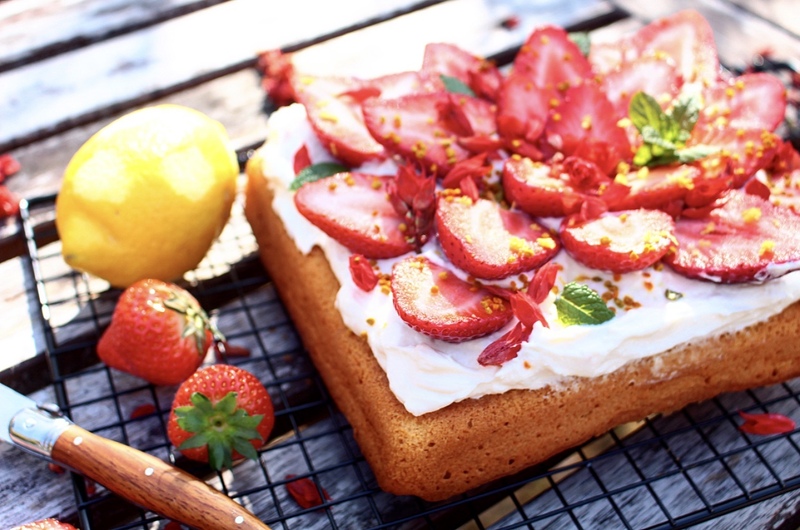 Summery strawberry cake topped with homemade lemon cream. Every summer, my grandmother used to bake the most delicious strawberry cake. For the cake, start by beating the butter and sugar with a mixer until creamy. Slowly add the eggs, one after each other whilst stirring. Mix the flour with the baking powder and add it in portions. Add the juice of 1/2 lemon and 2-3 tbsp of milk; continue stirring until all ingredients are well blended. Grease a rectangular baking form with butter and evenly spread the dough. Bake in the oven for about 30 minutes until the cake is golden brown and leave to cool down. In the meantime, you can cut the strawberries in halves and prepare the cream. For the lemon-cream, fill the ricotta into a medium-size bowl. Add the sifted icing sugar, the zest & juice of 1/2 lemon and blend with a mixer. Spread the cream on top of the cake and add the strawberries. Before serving, sprinkle some eatable flowers & fresh mint leaves and bee pollen. Posted in Food and tagged baking, Lemon, strawberry, strawberry cake, strawberry-lemon cake, summer. Bookmark the permalink.